Tom Rowles & Tiffany Frazee were married at a beach wedding, in New Smyrna Beach on 8/13/16. The ceremony and reception was held at the Smyrna Beach Club. This sunrise ceremony is stunning in its beauty. (Like the couple) We lit 10 total tikis with citronella oil and the sun arose during the vows. By far one of our favorite weddings of the year! We handled planning for the wedding and reception and catering was supplied Red, White & Blue Mule catering. 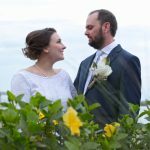 The couple chose the Maya four post bamboo arch, with 36 chairs, tiki torch aisleway markers, white runner, entry way sign and decor, and standard photography plus.